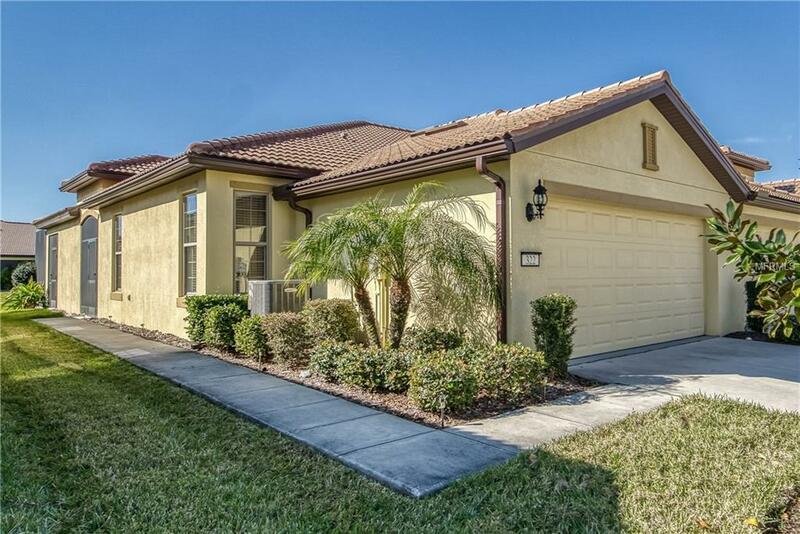 This beautiful two bedroom, two bath, two car garage, Sawgrass floor plan villa is in immaculate condition and move in ready! The gorgeous kitchen boasts 42" cabinets, stone counter top, closet pantry and breakfast bar. Limited edition open floor plan with Owner's suite at the back of the home that features a walk in closet and private bath with double sink comfort height vanity and large, tiled walk-in shower. The second bedroom is perfect for overnight guests, with the second bath located conveniently near it. Screened in lanai offers a nice place to relax with your friends overlooking the pond. Located in the maintenance free Del Webb Community, Southshore Falls. This gated community has a spectacular clubhouse with an abundance of amenities-3 community pools, hot tub, fitness center, internet caf, bocce ball, pickle ball, tennis courts & putting green. Very active community with lots of activities & clubs. Centrally located between Tampa, St. Pete, Bradenton & Sarasota (30-45 minutes) w/easy access to I-75. Close to airports, cruise lines, beaches and hospitals. Call for your private showing today!